Sono Osato opens an exhibition of new paintings, Babylon: The Buried Language Series, at Brian Gross Fine Art on March 5, with a reception for the artist from 5:30-7:30 pm. Osato’s work embodies ideas connecting language, archaeology and geology. A combination of encaustic, oil painting, drawing and assemblage, the visual elements create rhythms of movement and texture. The exhibition will be on view through April 25, 2009. Echoing historic layers of ancient texts and shifting geographical strata with thick layers of paint, Osato’s previously heavily painted surfaces give way to a more open approach. In Niniveh, a large triptych measuring 64 by 143 inches, hundreds of small, reclaimed objects attached to panel create a visual polyphony, like remnant hieroglyphics. 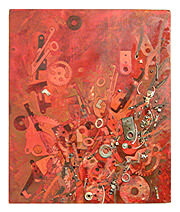 Mining parts from vintage typewriters and computer parts, Osato recontextualizes the metal hardware into compositions as though archaeological detritus. Merging and emerging from the real objects, silhouettes of drawn objects vie for space, perfectly integrating and creating a greater depth of surface. The painting has a powerful, physical presence with a vertical rhythm to the elements, revealing layers of the past marching to a hidden order. Sono Osato was born in Baden Baden, Germany, in 1960. She received her BFA from Arizona State University, Tempe, and her MFA from the California College of Arts and Crafts, Oakland. Osato’s work has been featured in exhibitions throughout the Bay Area including San Jose Institute for Contemporary Art; The Oakland Museum; Yerba Buena Center for the Arts, San Francisco; and di Rosa Preserve, Napa, California, among others. 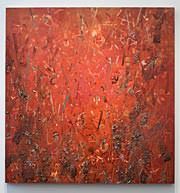 She has been a recipient of the Pollock-Krasner Foundation grant in 2008, 1999 and 1989. She currently lives and works in New York City.